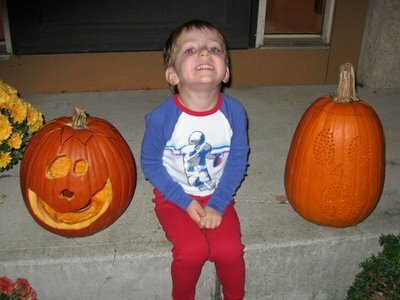 We finally carved pumpkins tonight. 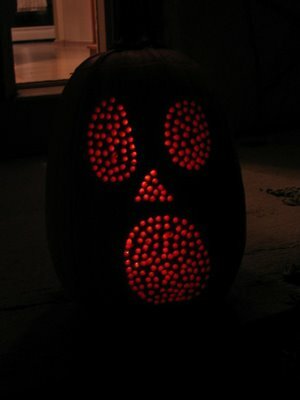 We bought six of them, thinking that we would carve and carve and carve. Not so much. At least we got two of them. Greg drew the face of the pumpkin on the left. One big eye. One small eye. A small nose and a big smile. The pumpkin on the right was tall and solid. The pumpkin wall was about 2 1/2 inches thick! I used a drill to dot matrix out the eyes, nose and mouth. Greg helped too. The photo came out better with no flash. Sometimes it's easier to see things in the dark.